It is still---a tea bowl! THUS I arrive in San Francisco. At first you will think of practice as a limited part of your life. In time you will realize that everything you do is part of your practice. Living beings are numberless; I vow to serve until all are liberated. Ignorance and grasping is boundless; I vow to transform and uproot it all. School nurse Janalee Stock administers a color blindness screening to Jared Ricadonna, a student at Morrison Elementary. Stock has been a nurse for the Athens’ City Public School system for 13 years. Stretching her skills among seven schools, Stock spends much of her work week juggling medical emergencies with everyday scrapes and bruises. Wow, this must be the season of features about esteemed friends! I hope this auspicious Spring is the sign of a stirring and fertile change. First it was a treat to see the article in the Athens News about Elisa Young, and her struggle to farm simply down on the Ohio River in the shadow of more and more power plants crowding the territory. [link] The very next day, yesterday, Ohio University's daily The Post ran a front page story on Janalee Stock, whose nursing serves the Athens School District. One becomes friends with Janalee in a very practical way. You could be doing almost anything...as long as it is a help somehow to someone else...and you look up, and there she happens to be, doing it too. It could be washing dishes after a community dinner of some kind. It could be setting up for a bake sale or selling the cookies on a street corner. It could be putting away folding chairs from a town meeting. You exchange pleasantries to ease the work, and before you know it and if you discover each other this way enough times, you're friends. Before Athens students scuttle between buses and classrooms each morning, district school nurse Janalee Stock pulls her office into a parking space, grabs an armful of files and heads to work. Stock, the only nurse for all seven Athens schools and their nearly 3,000 students, carries a heavy workload on the shoulders of her thin, 5-foot frame — and in her car, which doubles as an office, she said. Her workload is close to twice that of the nurses serving in nearby districts such as Alexander, where one nurse, a health aid and a part-time AmeriCorps worker serve more than 1,600 students. Because Ohio does not mandate school health service, the 1,100-student Federal Hocking school district is one of more than 50 districts with no nurse, according to the Ohio Association of School Nurses. A nationwide shortage of nurses is well-known among many people, but few realize how that translates to health care in the school environment, Stock said. Healthy People 2010, a plan by federal government agencies in the late 1990s to outline national health objectives, recommended a goal ratio of one nurse per 750 students, far from the ratio Stock manages every day. But she seems to view the challenge through rose-colored glasses – though on this particular day, her focused eyes are framed by bold blue specs. In her absence, Stock has an AmeriCorps aide, and school staff members handle minor medical problems and call emergency responders for more serious cases. “I trust them implicitly. I have to have that trust in them,” Stock said of her helpers. Amid her colleagues and students, the graduate of Ohio University and Hocking College has made a name for herself as much more than the band-aid lady. “She does her job with a smile on her face and never misses a beat,” Athens Superintendent Carl Martin said. Stock even drops by periodically to check Martin’s blood pressure. “She’s just totally interested in the well-being of the students and staff,” he said. In her thirteenth year with the schools, Stock has chosen to tackle student health risks, including obesity and AIDS, through education and preventative care. “I’m tired of reading about it. I don’t think school can be the end-all, but I think they can be a part of it,” she said. And she practices that preaching. The 51-year-old maintains her energy by eating healthy foods (and the occasional chocolate) and running in preparation for a triathlon she’d like to try this summer. Like many other school nurses in Ohio, she also makes time to research news about nursing and education, including the Healthy People 2010 recommendation of one nurse per 750 students. The OASN supports those goals but because the state’s education budget is tight, “Unless we find a way to discover some money, it’s not going to happen,” said Gail Pohlman, OASN president and school nurse for the Gallia County school district, about 40 miles south of Athens. Improving school health care in regions of rural poverty, which keeps more families from seeing medical professionals regularly, is especially important to Pohlman. “We [school nurses] are the health care professionals that students see in Southeast Ohio,” Pohlman said. Stock and teacher’s aid Debi Chonkl plan for the care of an insulin-dependent student. Although not in her job description, Chonkl consults with the student’s family daily and monitors the student’s sugar level about 3 or 4 times during a school day. “I trust them implicitly. I have to have that trust in them,” Stock said of her helpers. 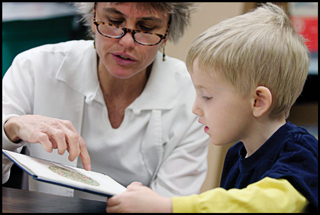 Stock administers a routine vision screening to preschooler Blake Stover, a student at Chauncey Elementary School. Most Chauncey students come from a lower-income background, which increases the need to perform simple medical tasks. “I’m the parents’ first line of defense,” Stock said. Stock checks a student’s head for lice at Chauncey Elementary. Lice can be a problem in poorer parts of the school district, causing students to be out of class for weeks at a time. Stock leaves the main office of West Elementary, where her makeshift office is located, and travels downstairs with her vision machine to checkup on students’ vision. Her machine, like much of her equipment, was donated to her. PS I think Katele Franko has done a wonderful job of writing---and just keeping up with Janalee's daily itinerary. But I don't think she wears blue glasses. She sure does have blue eyes though! for Holy Week from Ohio, thank you Jazzolog. High note of proximity in the prose type with action pics, goes a long way to promulgation! maybe even destination. Lots of smiles reading this, and all good and safe wishes to Janalee. Thats rather alot of schools for one person?